New York: American Heritage Copyright of this edition is 1974. . Reprint. Cloth - Hard Cover. Fine/Very Good. British Library, Historical Print Editions. PAPERBACK. 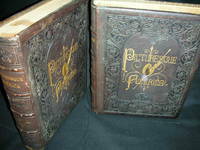 1241514453 Clean, has a good binding, no marks or notations. . Very Good. Heritage League of Pierce County, 1990. textured green leather with gilt titles and decorations. no writing or marks. 80pp.. Full-Leather. Near Fine/No Jacket. 4to - over 9¾" - 12" tall. Washington, DC: House of Representatives. Fine. 1977. First Edition. Paperback. Volume II - Science and Technology in the Dep't of State does not have a cover; All three volumes are committee prints . 354 pages. First edition in red leather binding with gilt lettering on spine, gilt edging and red ribbon placeholder. The senator's bookplate is affixed to the first inside page.